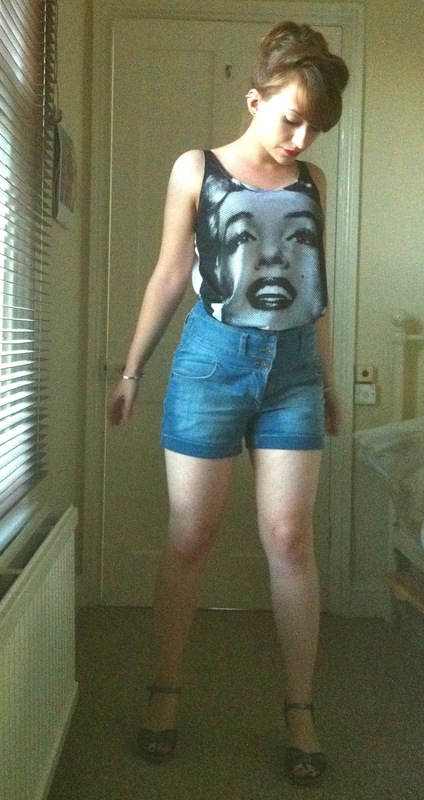 Following on from Marie’s shorts post, here’s my own take on using shorts to achieve summery vintage style. I know it’s raining, but we’ve all got to have something to look forward to, right?? Let me get one thing straight right away – hotpants of any form or description are going nowhere near these upper-thighs. Like Marie, I also don’t have legs up to my eyeballs at a vertically-challenged 5ft 2″ and exposing the entirety of what I do have is not going to make them look longer, just blobbier. But I do think when the weather is above 28 degrees – or when you’re on holiday somewhere hot where no one you know will ever see you – a well-fitting – and not too short – short is actually a more demure option than most mini-skirts. Much more practical against the English breeze if you are feeling brave in this country, that’s for sure. Shorts can look classy on the right girls. Marilyn loved a pair and she certainly had the pins to pull them off. So to get us in the mood for holidays and summer, here are some fabulous high-street shorts. They’re all under £25 as they’re nearly all in summer sales right now. Dark denim is by far the most flattering. Polka dots and animal print? I know, I spoil you. More likely to be found on the likes of our 50s beauties above, with a cute little jumper perhaps we can all look that glam. And here’s my pair that were £15 from Tesco a year or two ago. If anyone’s interested, the top I bought was a Miss Selfridge sale bargain last week at £12 and the sandals are last year’s M&S cork-soled wedges, chosen with Marilyn’s approval in mind seeing as she’s sporting some dainty wedges herself above.